Ullapool High Street @ High.St - High Street shops and High St businesses. Large Google map of Ullapool High St.
Ullapool is on the North-West coast, about 55 miles (88Km) from Inverness. Despite its remoteness, many people make their way to Ullapool for the wonderful scenery and to catch the ferry to or from the Isle of St Lewis. The peninsula provides natural protection for the harbour and the fishing boats. 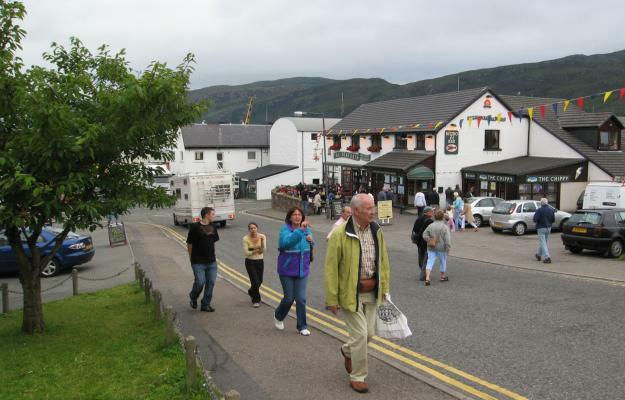 If you enjoy walking or fishing, Ullapool is a great place to base yourself. Alternatively, there are a number of excursions, both on land and water, that start from here. If you are in town, don't forget to take a look at Ullapool's heritage museum. There are plenty of places to stay in Ullapool, many of those in town are listed below, or try Taigh nam Bruadar, a B&B out on North Road. We have heard that Ullapool is the place to go for New Year, and can quite believe it given the number of pubs, restaurants and the friendliness of the local people. See you there!